The California State Board met at Paul Mitchell The School in Costa Mesa, Calif. From left to right: Kate Dawson, DeeDee Crossett, Frank Lloyd, Richard Hedges, vice president Joseph Federico, president Christie Truc Tran, executive officer Kristy Underwood, and Gary Duke on the legal counsel. The California State Board of Barbering and Cosmetology had a board meeting for the first time in a long time in Southern California at Paul Mitchell The School in Costa Mesa, Calif. The meeting was a part of the board’s scheduled off-site meetings that vary in location across California, giving local members of the salon community the ability to meet the board and to discuss their thoughts and concerns about the industry. Those that attended this board meeting were cosmetologists, hair-stylists, students, and beauty school owners. Issues that were brought up during this meeting included the regulation and licensing of braiding as well as state board oversight on barbering, cosmetology, and electrology schools. Although the nail industry was not as well represented, those who were present have been very active in the nail industry. Linh Nguyen, co-owner of Advance Beauty College, Phuoc Dam, salon owner and member of the Vietnamese American Nail Association, and Jaime Schrabeck, salon consultant and owner of Precision Nails were among those in attendance. I also met Quyen Tran, a representative from the office of State Senator Lou Correa, who has been active in bringing together nail techs and salon owners to discuss matters relating to the Vietnamese salon community. 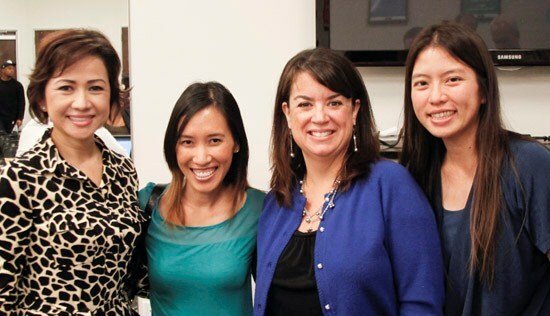 Here I am (far right) with (from left to right) California State Board president Christie Truc Tran, Advance Beauty College's Linh Nguyen, and executive officer Kristy Underwood. Christie Tran is the first president of the California State Board of Vietnamese descent and she is in a position to help bridge the gap between the state board and the professional nail industry in California, where close to 80% of salons in the state are Vietnamese. The California State Board holds most board meetings at the Department of Consumer Affairs headquarters in Sacramento, as well as disciplinary review committee hearings at various locations throughout California. The next board meeting will be held on January 11, 2013 in Sacramento. Visit www.barbercosmo.ca.gov for more information regarding the latest industry news, fact sheets, and handouts in English and in Vietnamese. You can also keep up with the board on the California State Board's Facebook page.